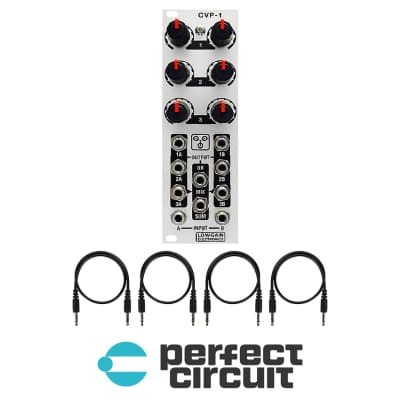 Dual 1 to 3 active buffered outputs with true Bipolar attenuverters. What that means is when the knob is set to the middle (detented for ease of use) there is 0 voltage/signal being passed to the output. I've found a lot of bipolar attenuverting circuits that rely on phase cancellation to have bleed when set to what should be 0 due to not having enough of a null range in the middle. The CVP-1 does not have that problem! 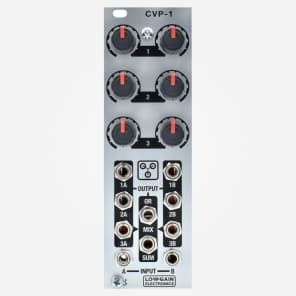 The CVP-1 contains two of these "aux send" circuits and in the middle lies a MIX section. 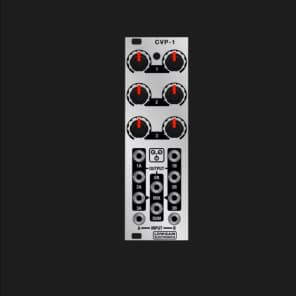 The inputs to the mix section are taken from Channel 3 outputs on each side of the CVP-1. There is a SUM output and an OR output. These are kind of a summation of the SubMix concept and the Short Bus concept wrapped into one module. It will allow for a large range of functions! 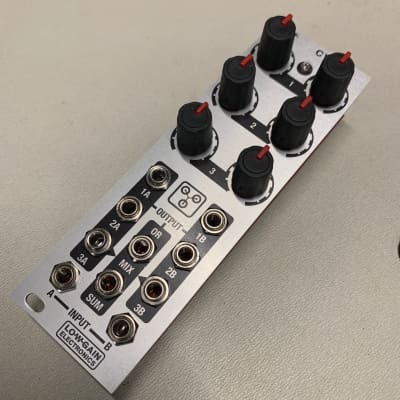 The CVP-1 is DC coupled and works very well for Audio signals much like an "aux send" module to send signals to various places through out your system.